Ben enjoys a sprint in his paddock. 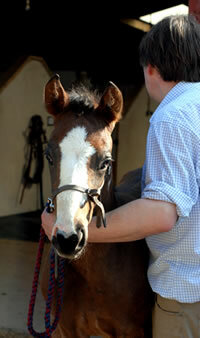 Life is proving very sweet indeed for Ben, the first coloured thoroughbred foal to be born in Britain. Ben was born at West Down Stud in Devon on February 26, being the first foal of the US-imported stallion I Was Framed - the first thoroughbred to be registered as coloured with Weatherby's. Ben, at just six and half weeks old, is awaiting the arrival of playmates. 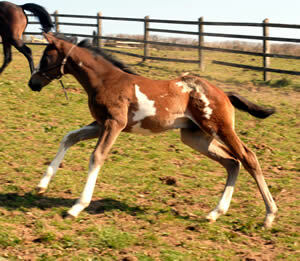 Another two foals are due at the stud this month. "He is doing really well and is growing so fast," says Ben's owner, Shena Halliwell. "Even our vet is amazed!" "His mum is now on five feeds a day, to keep up with his demands. She started to drop a bit of weight, so we're making sure she's well. "He is extremely bold, and will canter straight up to our numerous visitors at the fence without hesitation. Facsimile takes Ben for a run. All of Facsimile's progeny have been winners thus far, and high hopes are held for Ben. "He has no fear whatsoever! We are really pleased with his conformation and movement." Ben gets some handling at West Down Stud. Ben enjoys his days out in a paddock with his dam, Facsimile, unaware that his playmates may only be days away. 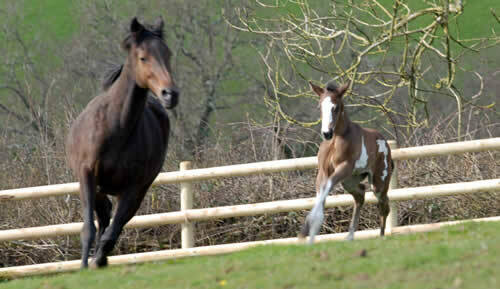 One foal is due on April 16, another eight days later. The latter has also been sired by I Was Framed. Shena said interest in Ben has come from all over the world. "We have had phone calls from Sweden, Denmark and the US to ask about him, and to ask if he's for sale, but we haven't decided yet."